“Exceptional coffee is always worth the quest.” this is the idea behind one of the latest Nespresso ads, starring George Clooney. 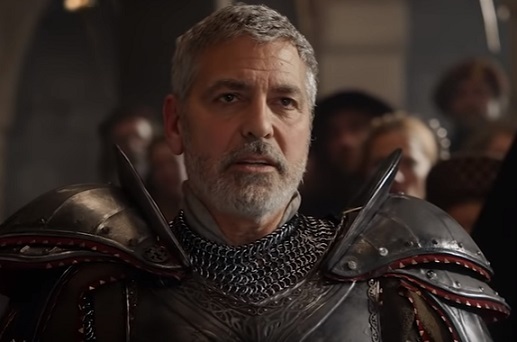 Titled “The Quest,” the 60-second spot features Clooney as a knight who brings the head of a dragon to the queen (played by Game of Thrones actress Natalie Dormer) in a royal court of the Middle Ages. Asked what he desires as a reward for having saved the kingdom, he just leaves the castle and, passing through the cinema screen, steps into the modern day streets of New York, in search of a Nespresso Coffee Shop. On his way, as he takes the subway and a double decker bus (after being ignored by a taxi driver), he learns that being dressed in a shining armor does get attention and that not everyone is friendly. But nothing stops him from getting where he wants and grab a cup of the beverage he so much enjoys: Nespresso Coffee. Once returned to the royal court, he shows the queen the only thing he desires, but this leads to another trip back to the future because the queen wants some herself, as well as the rest of the kingdom. The commercial, scored by the 1977 single “Solsbury Hill” by English musician Peter Gabriel, from his eponymous album, ends with a female voiceover saying “Exceptional coffee is always worth the quest” and with Clooney saying in voiceover the brand’s tagline, “Nespresso. What else?”. George Clooney, who has been a long-term partner with Nespresso in Europe and other international markets, starring in broadcast and print campaigns since 2006, said he was “thrilled to be back on set” for this new campaign. “This time I get to work with the very talented Natalie Dormer and live out my fantasy of playing the role of a medieval knight,” he also said. He also stars in a 30-second spot, titled “Really, George?” which is also part of the campaign and features many of the people responsible for every stage of the coffee growing process.